WEsay One of the top resorts in North America.This resort has a vibrant atmosphere, excellent accommodation and restaurants. A buzzing nightlife and ski terrain of every conceivable type! 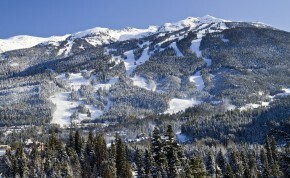 Here, amidst the towering coastal mountains of British Columbia, is a ski village unique in North America. The style is distinctively West Coast, the mood relaxed, and the skiing spectacular! In the attractive pedestrianised village centre, winner of several design awards, you will be charmed by the pleasant walkways and plazas with stylish shops and a huge choice of great bars, clubs and wide variety of restaurants. Whistler and Blackcomb both provide great intermediate and advances skiing on their gladed lower slopes. 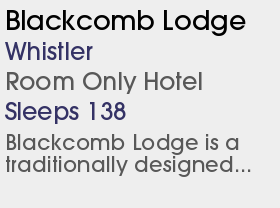 Further up they are much more greatly contrasted with a series of powder bowls on Whistler, whilst Blackcomb features steep couloirs and long glacial descents. 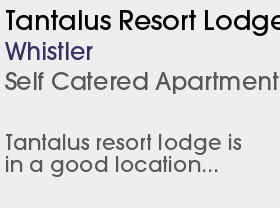 Both can be reached from lifts in Whistler resort. 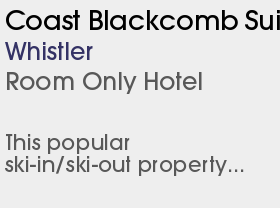 Blackcomb is probably best for beginners with nursery slopes served by a chair lift just above the villages. Whistler is considered one of the best snowboarding resorts in North America and has terrain parks on both mountains, as well as a Nintendo super-pipe and snowcross track on Blackcomb. The apres ski is good with the usual wide range of pubs and bars. Shopping is a vital part of the evening's entertainment too, with shops open until 10pm. If that doesn't get your heart racing then try spending an afternoon zipwiring instead. In the summer, Vail Resorts bought the company which owns and operates the mountains and some of the base area facilities and says it intends to maintain the exclusive brand and character of the resort . The novice area on Whistler mountain is being improved, with more terrain and two brand new moving carpet lifts.